Why are magicians and gamblers still interested in Expert at the Card Table? Why has this book attracted more attention today than when initially published? There may be as many answers as there are questions regarding this book. 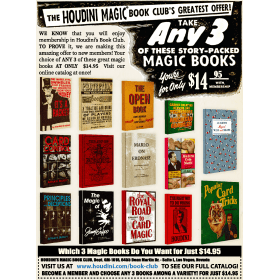 One of the most important books ever written on the subject(s) of card magic and cheating with cards. Expert at the card table, as Persi Diaconis wrote, embodies "the first refined technical description of card sleights" Precursors pale in comparison. it may be, as Diaconis also suggests, " the best book ever written on sleight of hand." But if this proves to be rhapsodic hyperbole, what is less debatable is the fact that this wide-reaching, perdurable book has influenced other books of this type subsequently published. Consider, for example, the number of spin-offs and annotations, including the lackluster ones by Professor Hoffman. Also, consider Shaps and Flats (written prior to Erdnase) (1894), Cheating at Bridge (1933), Marked Cards and Loaded Dice (1952), and the seminal, Expert card technique (1940). Also, consider the germane material published by Dai Vernon and Ed Marlo. 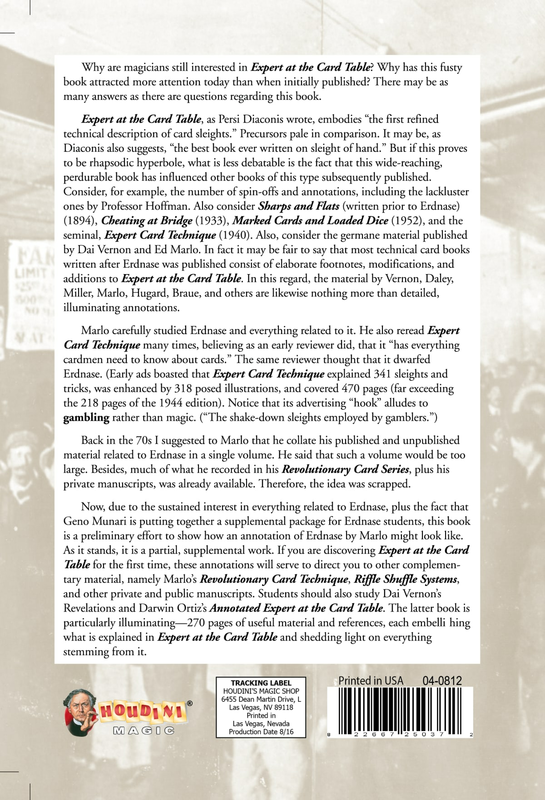 In fact, it may be fair to say that most technical card books written after Erdnase was published consist if elaborate footnotes, modifications, and additions to Expert a the Card Table. In this regard, the material by Vernon, Daley, Miller, Marlo, Hugard, Braue, and others are likewise nothing more than detailed, illuminating annotations. Back in the 70s, I suggested to Marlo that he collate his published and unpublished material related to Erdnase in a single volume. He said that such a volume would be too large. Besides, much of what he recorded in his Revolutionary Card Series, Plus his private manuscripts, was already available. Therefore, the idea was scrapped. 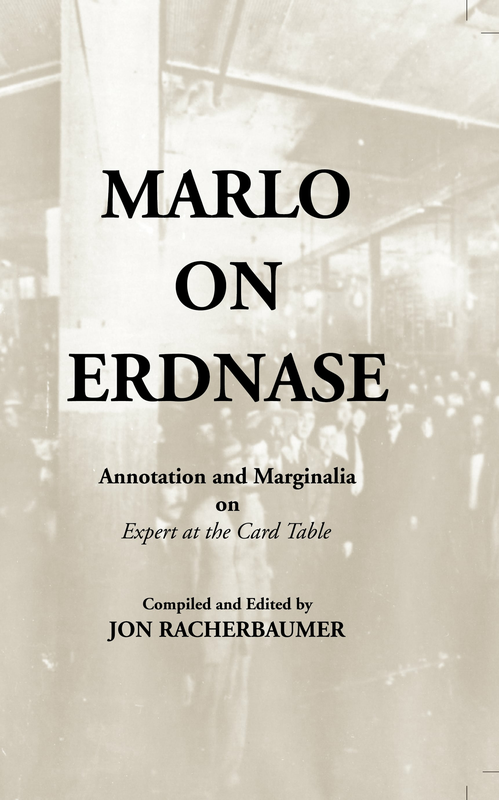 Now, due to the sustained interest in everything related to Erdnase, plus the fact that Geno Munari is putting together a supplemental package for Erdnase students, this book is a preliminary effort to show how an annotation of Erdnase by Marlo might look like. As it stands, it is a partial, supplemental work. if you are discovering Expert at the Card Table for the first time, these annotations will serve to direct you to other complementary material, namely Marlo's Revolutionary Card Technique, Riffle Shuffle Systems, and other private and public manuscripts. Students should also study Dai Vernon's Revelations and Darwin Ortiz's Annotated Expert at the Card Table. The latter book is particularly illuminating -- 270 pages of useful material and references, each embellishing that is explained in Expert at the Card Table and shedding light on everything stemming from it.